The day after Christmas 2010, two feet of snow buried New York City. Mayor Bloomberg got buried by the press when the snow removal took far too long. 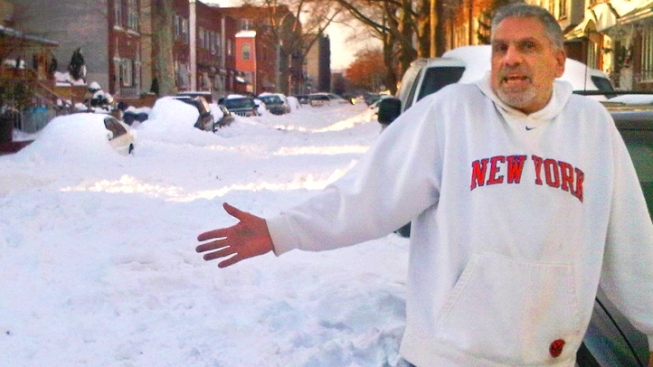 In this cell phone image, Angelo Annunziata complains about the still unplowed snow in front of his house on 62nd Street and 23rd Avenue in Brooklyn several days after the storm hit. Millions of people across the Northeast, where many communities have yet to recover from Superstorm Sandy, now find themselves bracing for a blizzard on Friday. With a blizzard warning in effect for New York City, Connecticut and much of Massachusetts and Rhode Island, it's reasonable to wonder, what exactly is a blizzard? "From my end, technically speaking, blizzards are not what they used to be," joked Paul Knight, a senior climatologist as Penn State. "When I was a kid it was quarter-mile visibility, sustained winds of 35 mph and the temperature 20 degrees or less." Although the scientific definition still holds, Knight says people use the term much more casually these days. Originally, the word blizzard referred to a shot from a musket or cannon — but it was first used to describe a storm in the 1870s by an Iowa newspaper. Halloween 2011 –Halloween was postponed a week across much of Connecticut, as a freak storm hit the region. 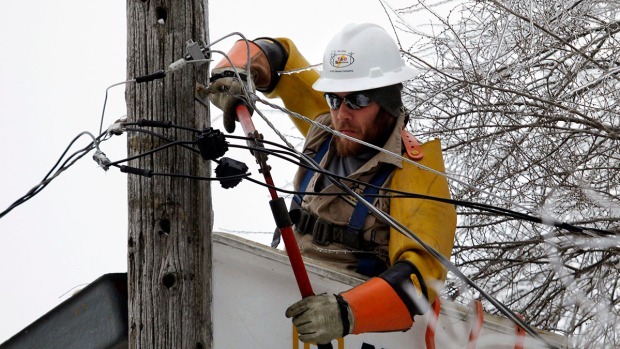 But the problem wasn't so much the snow, of which there was plenty, as it was the ice that glazed roads and power lines, leaving thousands without electricity for more than a week. Boxing Day 2010 – The day after Christmas saw two feet of snow bury New York City. Then Mayor Mike Bloomberg got buried by the press after snow removal took far too long. In fact, the city's response was so bad that even hizzoner admitted they blew it. Snowmageddon/Snowpocalypse – The nation's capital got pounded by so much snow during the first week of February 2010 that even President Barack Obama was calling it "Snowmageddon." Ironically, the storm shut down the government just as a global warming bill was trying to get through Congress. This was one of three huge storms to hit the nation in that single month. April Fool's Day Blizzard of '97 – Rain, sleet and snow fell from Maryland to Maine, leaving hundreds of thousands without power and as much as three feet of snow to shovel. Blizzard of 1996 – From Jan. 6 to 8, New York City got 20 to 30 inches of snow, Providence got 24 inches, Boston and Hartford got 18, parts of New England saw up to 33 and President Bill Clinton shut down the government. The storm killed more than 150, and damages totaled more than $1 billion. Blizzard of '78 – This one shut down the state of Connecticut for three days, as 2 feet of snow and whipping winds made for massive snowdrifts and impassable roads. Massachusetts and Rhode Islands experienced record 24-hour snowfalls, there were nearly 100 deaths and damages totaled nearly $2 billion. Great Blizzard of 1947 – Probably the whitest Christmas in New York City's history. By the time the snow had stopped, there were more than 26 inches in Central Park. Cars and buses were stranded, the subway was at a halt and 77 people had died. Blizzard of 1888 – This was back in the days when a storm could really catch you off-guard. The forecast for March 11, 1888, called for "cloudy followed by light rain and clearing," geese were already heading north and Walt Whitman had written a poem about the first flower of spring. And then parts of New York and New Jersey got 40 inches of snow, while Connecticut and Massachusetts got 50. But while historic storms hit from Halloween to April Fool's Day, they definitely cluster around a time when two factors make blizzards most apt to happen. "February, at least centered around February, is blizzard season," explains Knight. "The reason for that is that the chilly air in the northern reaches of North America has kind of maxed out at this point, and if there's going to be a time for it to come south, it's going to be late January or February," he explains. "The second thing is the temperature contrast between the water and the cold air over the land is almost at a maximum now. That then leads to the potential for storms, because storms are totally driven by temperature contrast." As bad as some of these recent storms have been, Knight notes that it's important to realize that they're really not so out of line with past snowfalls. "We've just gotten used to (warmer winters). It's so human: We adapt to the very pleasant weather of last winter and say, 'Well, this is the way it should be,' or 'This is what we think the new norm is,'" says Knight. "Insofar as the shift in climate is going to make the winters notably milder, then when we get a more normal winter, which is what we're having, we will perceive it as being worse than they really is. But this is really not that bad." And no matter how bad things do get this weekend, overall this will have been another mild winter, Knight says. "Given the amount of warmth we've had, when you incorporate December, January and now at least the first half of February, there's no way we're gonna get temperatures for that three-month period to average below normal anywhere in the Northeast," he said.